Regular service keeps quality performance up while holding operating costs down. This is the service philosophy you use with your vehicles, so why should your HVAC equipment be any different? As utility rates continue to rise, you’ll want to get the best mileage out of your system by keeping it running at peak efficiency. Del-Air is proud to offer these popular annual maintenance agreements. Choose the one that suits your particular needs, or call your Del-Air customer service representative today for a free consultation on the best package for you. See the checklist below to see which ones are applicable to each package. 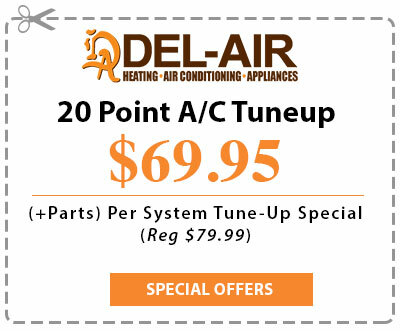 If you’re looking for a new air conditioning, Del-Air Heating and Air Conditioning has a low price guarantee. Learn more about the top 10 reasons to buy from us!